The 10 Meter 45 Watt Galaxy Radio DX99V2 has the same features of the DX99V and the same main circuit board used in DX98VHP. The DX99V2 has a ton of features like a Blue LED display for Channel and Frequency Digits, Talkback circuit with on /off switch, Red Modulation Lamp, Front Microphone Jack; and High SWR Alert and more. 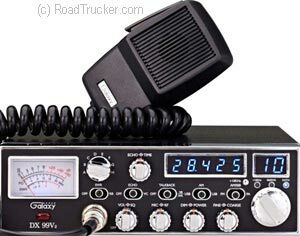 Please Note: There are No Returns or Exchanges on Galaxy 10 Meter Radios by RoadTrucker® or the Distributor. You Must Contact Galaxy Directly as they warranty their 10 meter radios for 3 full Years.